Terrorists who carried out multiple shooting attacks on Israeli vehicles in Binyamin arrested. 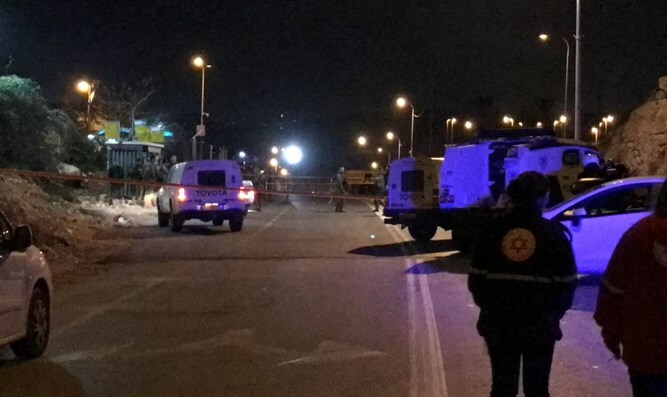 The Shin Bet, the IDF, and the Israel Police arrested in Januray two terrorists who had carried out shooting attacks on a main road in Binyamin, it was cleared for publication Sunday. The terrorists, who are 17 year old youths, were arrested several hours after one of the shooting attacks on January 27. They are residents of the village of Deir Abu Mashal in northwestern Binyamin. The Shin Bet discovered during its investigation that the two had committed shooting attacks against Israeli vehicles, in the western Binyamin area on November 14 2016 in addition to the attack on January 27, 2017. The two were also involved in additional attacks. There were no injuries in any of the incidents. Two improvised "Carlo" weapons were seized; ballistics tests showed that they matched shell casings found at the attack scenes. The foregoing again shows the involvement of minors in severe terrorist actions as well as the tangible security danger posed by the accessibility of improvised weapons. The Shin Bet, along with the IDF and Israel Police, views these acts of terrorism with utmost gravity and will act to prevent and thwart terrorist activity and attacks. The IDF and police forces also arrested yesterday (Saturday) two Arabs suspected of throwing firebombs at the gate of Migdal Oz in Gush Etzion. The detainees were interrogated by Judea-Samaria police. Video documentation released this morning by the IDF Spokesman shows Arabs throwing three firebombs at Migdal Oz on February 3, two-and-a-half weeks ago. Meanwhile, IDF forces arrested three wanted Arabs during the night in Silwad in Binyamin. They are suspected of engaging in guerrilla activity and fomenting riots, and were transferred to security forces.